Go straight to browse or buy from our cotton t-shirt catalog, or read on the learn about the difference between cotton t-shirt btands. 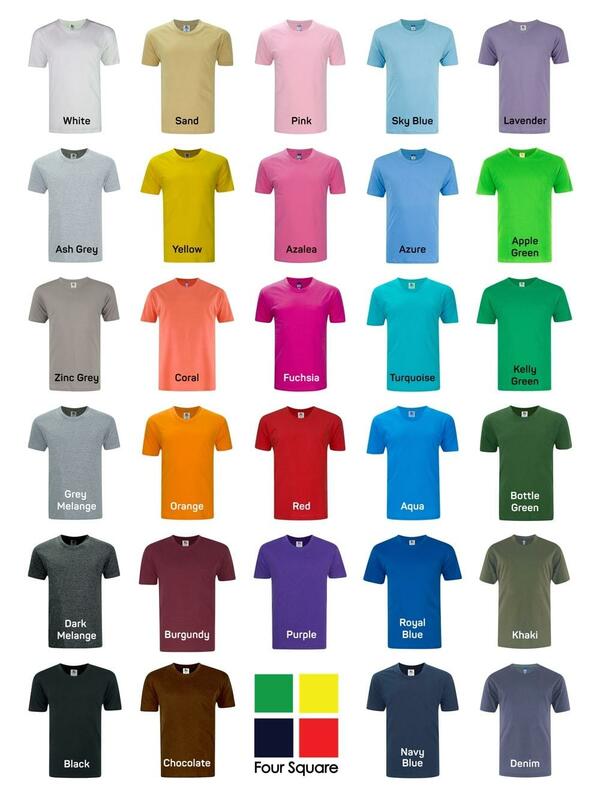 This chart summarises the difference between our cotton t-shirt brands available for sale. If you re interested to know the details of each t-shirt, please read on. MD Textile is arguably has Malaysia's largest collection of T-Shirts. There's a dizzying about of various types, colors and sizing, including a option of various brands. The day you are born, we have that t-shirt for you. The day you die, we also have that t-shirt. Even for the overweight and the underage, our sizes starts from "New Born" to 8XL. And to top it up, there's 100% Cotton or 100% Polyester or a blend of both. Best of all, they are offered at very good prices, well below the market value. 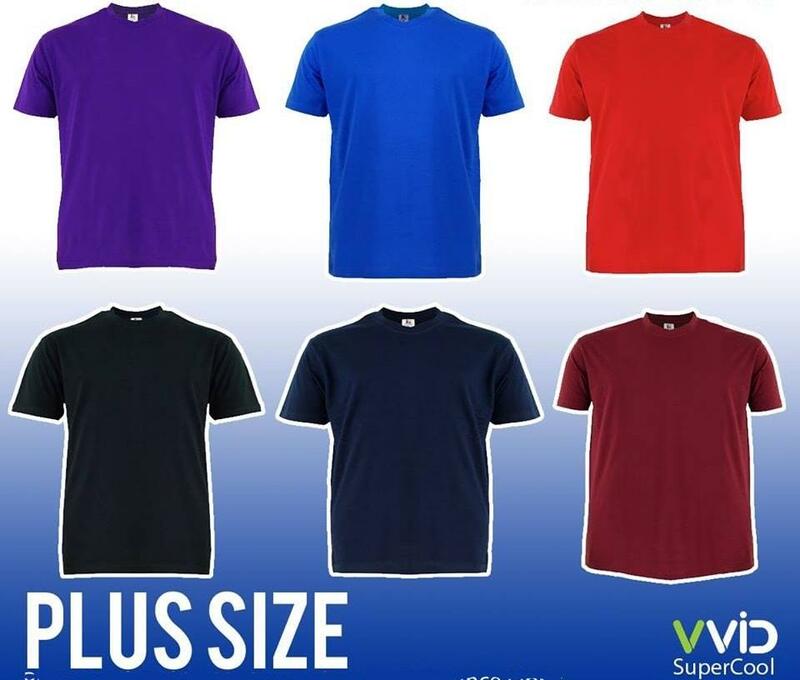 However, which t-shirt is best suited for your needs? 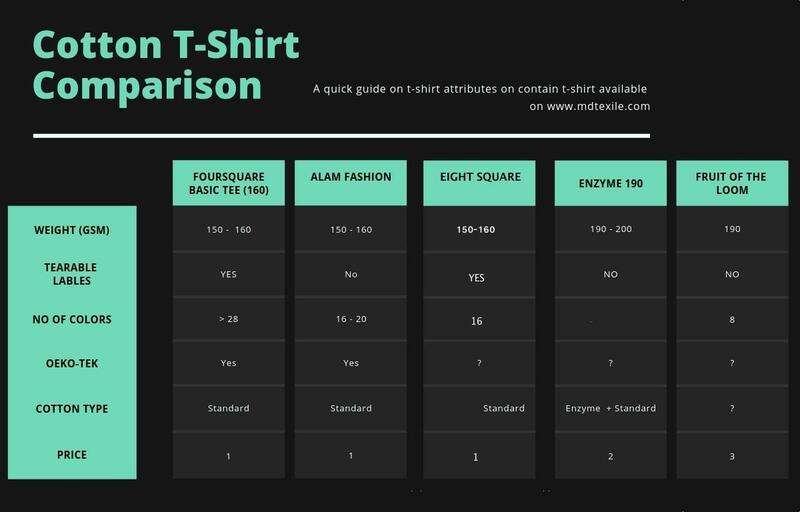 This guide explains all you need to know when choosing the right t-shirt. From here on, most Malaysians seem to think that the thicker to fabric, the better the quality. Well, yes and no. Obviously the thicker the fabric, the more material it has, it will last a little longer. But there's a part that the customer do not really know - the quality of cotton and composition of cotton. 100% Cotton tags also means prone to shrinkage and skewing. Yes, even those that claims to be preshrunk can sometimes fail. All brands, good or bad can sometimes have this problem, but reputable brands like Foursquare and Fruit of the Loom, have significant less tendency to shrink and skew. 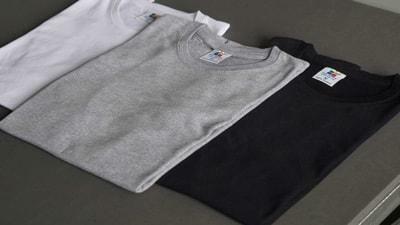 Some t-shirts are made of blends of cotton and polyester. We generally think that the CVC versions , which is about 70% Cotton : 30% polyester, these are great. The last long, the resist shrinkage and skewing, and they absorb sweat pretty well. The TC versions, which is now 30% Cotton : 70% polyester are utter crap. They have a waxy, hard feel to them, but they do last the longest. All fabric needs to go through a dyeing and finishing process. Greige fabric (or undyed fabric) may be the most environmentally friendly, but it's definately no fun. Nobody wants to wear something that is rough on the skin, hard to touch and smells. But not all dyes are created equal. Some may have cancer causing properties, which you may not even know. 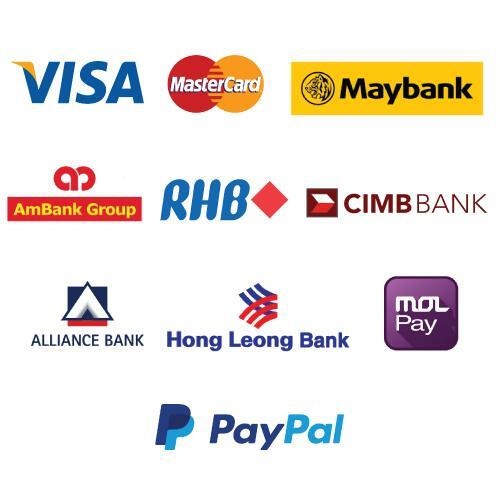 Generally anything that has the OEKO-TEK certification like Alam Fashion and Foursquare and safe. When you see the OEKO-TEK Certification on the neck label or the carton, it means that the product has been certified by a third party institutution. 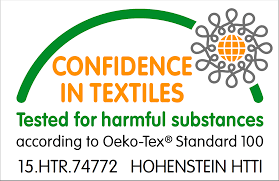 The textiles and fabrics are certified free of harmful chemicals and are safe for human use. More than 100 substances kwown to be harmful to human health have been tested to obtain this certification. Now that you have a brief understanding on what goes into a t-shirt, the next product is a rather odd one. This series position itself between the 160gsm and the 200gsm. It has the same characteristic of the 160gsm, just that it is thicker. We have only 3 colors in stock, but we think these series is certainly value for money. Next on the scale, is the premium range, with Enzyme series being the thickest of them. 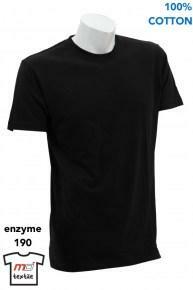 Enzyme is MD Textile's house brand, that is why the pricing is lower than international brands such as Gildan Premium Cotton and FOTL - Soft Premium. Other than that, they are all very similar, with FOTL slightly being better at quality control and consistency. Maybe it will help to know that Warren Buffet owns FOTL. Please don't be confused with Gildan and FOTL value versions. We do not carry them at the monent. While products #1, #2 and #3 are made from standard quality (Uncombed) cotton, Fullycombed cotton is a step better. Whats the main difference? The cotton is put through a combing process, whereby all the short fibers are removed, leaving the long fibers intact. The result is a softer, smoother, shrink resistant grade of fabric. While since this is clearly better, why are the basic range more popular? Bangladesh produces much of the standard cotton fabric. They go through a process of enzyme wash and silicone coating. The result is an even softer and smoother fabric which customers equate it to as more quality! It's also way cheaper than the combed variants. But wait, there's a drawback. a spanking new Bangladesh made t-shirt is not superior is water absorption qualities, because there is a layer of silicone on it! Really, if you want superior absorption qualities, consider the microfiber performance jerseys. They are way better (but not really environmental friendly) in quality these days. Sadly, our local Malaysian factories do not have the know how to make a standard cotton look and feel this good. We are much better off on the microfiber / polyester versions. Our fullycombed cotton fabric are of Indian origin, and low in contanimation. We used them only a selected range of products. Babies deserves something more organic, natural and quality. After all they cannot complain! Our entire range, rompers, booties, jumpsuit, etc are just more friendly to our little ones. Big people sweat more. The fullycombed series is just more breathable. Muslimah dresses use more fabric. More fabric traps heat. So the fullycombed cotton is the better choice. We hope this article clears up most of the misconceptions inherent in our industry. There days we are spoilt for choice. There are so many differing qualities and ranges, that sometimes we ourselves get confused! Next week, we will discuss about the microfiber range, which is an entire new topic on its own.